Gurwitch, who was fired from a Woody Allen play, put together this ensemble of 15 performers telling stories of being fired. The material and delivery are generally at the level of competent stand-up and are often amusing, though many performers are too loud and shrill. Sandra Tsing Loh, who caterwauls, and Charlayne Woodard, who is painfully over the top, make the Wicked Witch of the West seem subdued. Some stories don't fit the topic, such as Carl Capotorto's, but are still funny. Rejection has never been so hilarious! After her role in a Woody Allen play was rethought, actress Annabelle Gurwitch (TBS' Dinner and a Movie) was devastated. Then, she got funny. 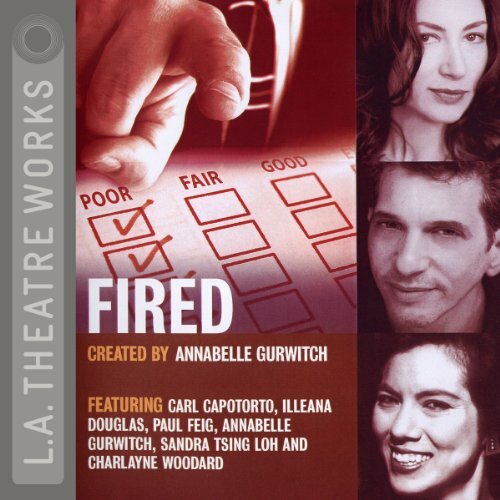 Gurwitch and a revolving cast of fellow show-biz veterans share their stories when L.A. Theatre Works records Fired: Tales of Jobs Gone Bad. Annabelle Gurwitch in "Crimes and Mythdemeanors"
Carl Capotorto in "Stories I've Decided Not to Tell"
Jason Kravits in "Dead Man Working"
Matt Walsh in "Ba-Looney Tunes"
Dana Gould in "Jimmy, the Idiot"
Jim Turner in "You Be a Man, I'll Be a Man. You Treat Me Right, I'll Treat You Right." Roy Zimmerman in "I'm Fired"
Paul F. Tompkins in "Video, Video"
Taylor Negron in "Goblins in the Stock Yard"
Illeana Douglas in "Poor Judgment"
Paul Feig in "The Big Red Shoe Diaries"
Elizabeth Warner in "12 Angry Witches"
Sandra Tsing Loh in "The Little F*&K That Could"
(P)2005 L.A. Theatre Works. All Rights Reserved. Some of the brightest lights of the comedy world join together in this delightful collection of always amusing and often hilarious anecdotes of "failure" from their own lives. I especially enjoyed Paul F. Tompkins' (a particular favorite of mine) story about his being fired from two different video store jobs, but all of the stories were quite good (as well as the Roy Zimmerman song). Compared to the cost of the usual comedy album download, this collection is quite a bargain and can be counted on to give your spirits a lift--it certainly did for me! Put a little funny in your day... excellent material for your ipod. Good format - a series of short, comic anecdotes, and a surprising variety on the theme. Don't forget the sequel, "Fired Again". Enjoyable reminder to rise above, see the humour in a bad situation, and that no matter how bad today is, there is always someone more pathetic than you! The sample clip was humorous, but that was the best five minutes of FIRED: TALES OF JOBS GONE BAD. Audible has much funnier plays/monologues available. Skip this one. Not a lot to say: There's a magic to informal live theater and improv/comedy. I can imagine this having been a great experience in person, but I'm not sure. On audio though, I found it fell flat. If you're smarting from a firing, you might find more here than I did. Some fun details, but I can't really recommend it.